The war was won by FIFA many years ago, but like an oblivious Japanese soldier, Pro Evolution Soccer - better known by its PES moniker - continues to lurk in the undergrowth, carefully biding its time. Perennially citing problems adapting to the new-gen consoles, we are now in the next phase of gaming and PES 2015 still remains an idiosyncratic affair. So what do you get for your new-gen console buck? Well, it's all about panning shots of vaguely recognisable players, and extreme close-ups of their carefully rendered hair. That's about it. So if you were thinking of making the plunge to PS4 or Xbox One, this isn't really the game to do it for. What it is, however, is a deep, intriguing recreation of the national sport that takes some time to bed in, let alone master. Attempting to ping the ball about in PES 2015 with one-touch football simply won't work, and leads to frustration as possession is constantly lost. It's all about opening your body up (not literally), taking a touch and playing the way you're facing. That takes a certain amount of joypad gymnastics, but you do eventually get into the swing of it, adapting to the more measured approach and selecting your next pass with the bigger picture in mind. Or you could just revert to type and employ the time-honoured diagonal lofted through-pass, although it's by no means as fool-proof as in previous Pro Evo incarnations, requiring a deft touch to pull off. There's a marked difference in opponents' artificial intelligence this time around too: some will sit back, whereas some swarm all over you, forcing a change of tactics. With a rich tapestry of goals on offer, when trapped in the headlights of an oncoming goalkeeper, a calm head is required, either to guide it into the corner or audaciously chip it over the hapless net-tender. Headers are also back on the agenda, with a lofted cross often met on the meat and arced gracefully into the net, as opposed to bulleted past the keeper. Sprinting down the wings is a hybrid of holding the right trigger or pumping it like a dervish, the latter offering less by way of ball control, but more in terms of straight-line speed. It's a system that also makes for some fairly adroit manual dribbling, with a well-pumped surge of pace enabling you to bypass defenders and find space. When the ball's on the other foot, that being when you don't have possession, PES 2015 a very different ball game. At the risk of sounding like a hoary old pundit, the slide tackle has almost been rendered redundant, such is the frequency with which it results in a foul. And to add insult to injury, almost every foul results in a yellow card, often followed by a red, with the inevitable repercussions in terms of suspensions when playing through a season. In the elevated heat of a two-player game, it's not unusual to end up with nine-a-side. As such, it's easy to resist the temptation to make any sort of lunge, but even the "soft" tackles can result in a foul, putting us in the realms of a non-contact sport whereby you simply wait for the opposition to lose possession. Conversely, it's even more important to keep the ball when you have it, although this isn't helped when a seemingly straightforward pass will occasionally go in an entirely arbitrary direction. 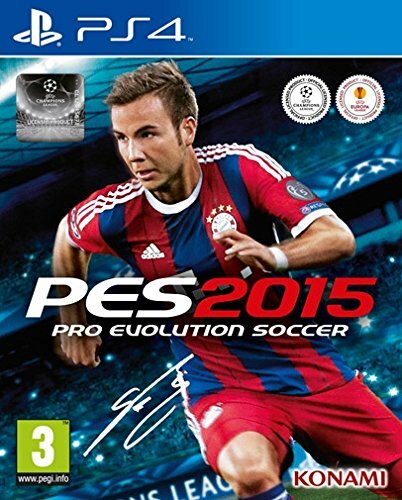 Not perfect then, but still eminently playable, and Pro Evo 2015 comes with a raft of features with which to perfect your skills. The time-honoured Master League is present and correct, with a perverse level of detail offered when creating a visual representation of your manager - eyebrow type, anyone? The big new thing this year is the introduction of the so-called myClub, presumably a reaction to FIFA's all-conquering Ultimate Team. Effectively an online Master League, it seems baffling in its complexity, and more will presumably become clear once the online element settles down - as ever it has been stymied by day one problems. Still hanging in there is the preposterous Be A Legend mode, which some years ago tried to convince us that it would be fun to have control over only one player. This is a mode solely for those who find entertainment in trying to stay onside, or sitting on a bench. The commentary is essentially the same as it ever was, with John Champion and Jim Beglin often appearing to be watching different games - the same shot can be greeted with "Way off!" from one and "Cracking effort!" from the other. There's generally a decent atmosphere, however, but while the Champions League and Europa League are included, the lack of licensing for English teams (apart from Manchester United) remains embarrassing, even more so now that PES has been extended to the Championship - welcome to the game, East Dorsetshire (Bournemouth) and West Yorkshire White (Leeds). In the game's defence, the player names are at least accurate. With FIFA is seemingly treading water with its most recent releases, Pro Evo 2015 has hit the new-generation of consoles running, providing a hugely playable game for those prepared to put in the time. There are still some oddities included, both on the pitch and in the vast suite of modes, but for all its foibles Pro Evolution Soccer 2015 is a hugely enticing package... even if it doesn't have the licensing for proper English team names.